This webinar is a capstone activity for our START HERE online course. Meet Chuck and discuss your stand-up comedy. Discuss your set list for a stand-up comedy routine. Outline the steps to achieve your career goals. Sign up for START HERE, our free online course. Review the course material to prepare for the webinar. Entertain yourself and others by completing the online course activities. 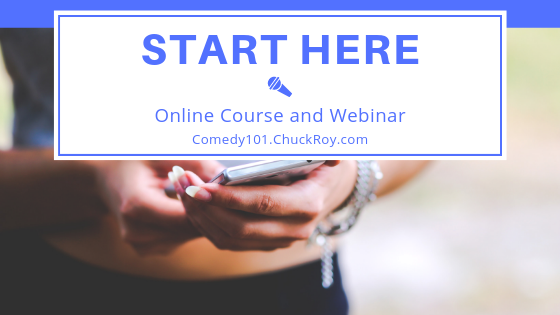 Chuck hosts this webinar to demonstrate a high-quality Comedy101 experience. Ask questions and get answers based on 25+ years’ experience performing stand-up comedy. Attend this professional video conference to meet people, make friends and promote your comedy. Get professional advice and feedback about your comedy. This webinar is designed for professional comedians that want to meet Chuck and talk about stand-up comedy. Amateur comedians with a strong desire to become a working comic. Public speakers that want to add humor to their speech. People that want to be funny. Register for “START HERE” and get your Free Invitation!